As a parent, I am always excited to introduce the world around us to my children. Sometimes it is so easy to take our world for granted--and lose appreciation for God's Creation. 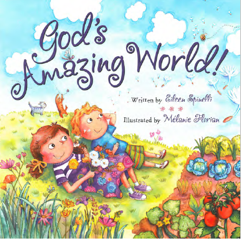 I was excited to review God's Amazing World!, written by Eileen Spinelli and illustrated by Mélanie Florian with my family. 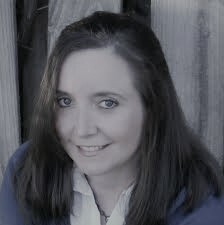 I am even more excited to offer one of my readers a copy of the book as well in the giveaway at the end of this post! Quick Summary of God's Amazing World! Gracie and her cousin Bo explore the seven days of Creation, all without leaving the backyard! As Gracie tells the story of how God made the world, she and Bo find evidence of each day’s work right there around them. When they get to Day 2, the day God created the sky, they take a moment to cloud watch. Day 3 leads them to play in the water, and on Day 6, they imitate the cows and pigs and lions God made. This sweet, clever picture book by Eileen Spinelli overflows with enthusiasm for God’s Creation, and children will catch the excitement and will begin to view their own surroundings as a tour of God’s lovely world. Parents can use this beautiful book to introduce children to the concept of God’s work in the world and to encourage appreciation, understanding, and stewardship of the world around us. Would I recommend God's Amazing World! by Eileen Spinelli? It's a beautifully done story--and it leaves readers both with smiles and reminders of the significance of our surrounding world and God's Work. 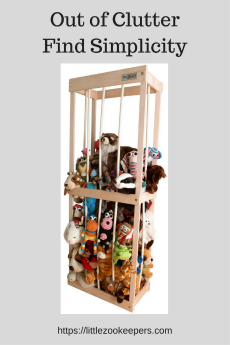 It is well suited for preschool and early elementary students and would make a perfect Spring addition to a family library (or as an Easter gift). Enter to Win a Copy of God's Amazing World!